The property of Rue du Lac offers a 2 bedroom cottage and a 1 bedroom apartment. They may be let as one unit or individually. 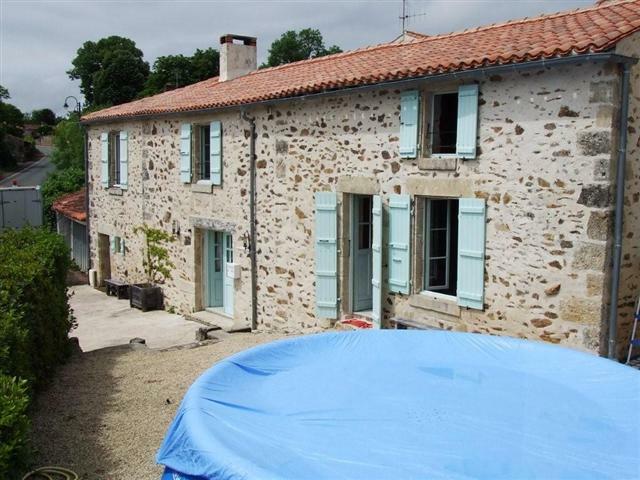 This lovely house is located in the small, peaceful village of Mervent. There are stunning views from the property overlooking the beautiful lake and forest areas. There is a heated swimming (plunge) pool at the property, also there are beaches at the lake which is a very short stroll from the property. This has been lovingly renovated to an exceptional standard and offers many original features including beamed ceilings, stone walls, original fireplace etc. Both bedrooms large enough to take an extra bed if required. Cot also available. 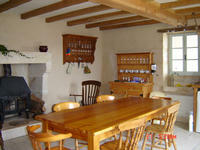 Large country kitchen which is fully equipped including electric fan oven, ceramic hob, fridge, washing machine etc. Dining area has table and seating for 8 people. Lots of lovely features including wood burning stove set in original fireplace. Large sitting room with a bed settee. Outside is a heated Swimming (plunge) Pool and a covered BBQ area with table and chairs. This apartment has again been lovingly restored at an exceptional standard retaining many original features. 1 double bedroom with en-suite facilities. Upstairs is a kitchen/living area. The kitchenette is fully equipped with gas hob, microwave and washing machine. Again offering stunning lake views. Security Deposit of £100 per property - fully refundable if no damage to property. Hire of bed linen an optional extra at £10 per person per week. To book a 25% deposit is required and balance 12 weeks before start date. Changeover day is Saturday. Departure 10am. Arrival 4pm. The house is in the small, peaceful village of Mervent. There are stunning views from the property overlooking the beautiful lake. There are good local restaurants in the villages and a very large selections of restaurants and cafes etc in the rennaissance town of Fontenay Le Comte, which is located approx 8 miles from the property. Within the Forest and surrounding area there are many outdoor activities including hundreds of miles of forest walks, cycling, canoeing, horse riding, swimming, adventure park for younger children and one for older ones/adults, a zoo, fishing and much more. The beautiful beaches on the Atlantic coast are 1 hours drive away. More information and photos of Vendee beaches, attractions, activities, weather etc can be found at the top of this pate in the links box to the left. The nearest Airport to the property is La Rochelle which is 40 minute drive away. Any guests flying to La Rochelle and not wanting to hire a car may be picked up at the airport and taken to the property, taken to get some groceries, and at the end of the holiday taken from the property back to La Rochelle Airport. Extra supplement for this service of £60.